Your Summer BFF is here. As you know, swing dresses are all the rage. . It's solid, can be dressed up or down, and is as comfy as your yoga pants....and it comes in sizes S-3X and the all best colors. It's a best seller for a reason, friends. We have outfit ideas below, but just know that we wear ours to everything from Saturday soccer games to date night. It's that good. 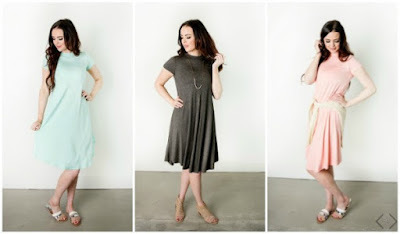 Style Steals - 5/22/17 - Short Sleeve Swing Dress for $21.95 + FREE SHIPPING w/code SWINGSTEAL. The code is SWINGSTEAL and it will make each dress $21.95, with FREE SHIPPING!. The code is valid Monday, 5/22 only. Find your favorite ball cap, add your comfiest flats and you are good to go for soccer games, errands, everything a busy day throws at you! Tie a shirt around your waist, add cute sandals and your best shades, and you are ready for everything from a PTA meeting to brunch with the girls. Add your favorite ankle boots or stacked heel sandals and a statement necklace and this dress carries you from work to a night out with the hubby to a garden party. A long necklace and heels is always a classy choice and pair perfectly with this swing dress. Don't forget to add a cute blazer or cardigan for those places where the AC will be cranked up - we're looking at you, office and movie theater. It adds a little structure to your swing dress, switches up the feel, and will look amazing.